Many people, especially those who with limited budgets or who do not cook often, have a limited herb/spice collection. They may not cook enough to make purchasing a wider variety cost-effective but this does not mean they should be denied food with flavour! I propose a machine in supermarkets or elsewhere which will vend small quantities of various herbs and spices suitable for individual recipes. Yes, what spices go with these wines? That, [dbmag9], is an awesome idea. If Schwartz (or other major spice purveyors) had a machine in the supermarket where I could dial up a spice mix and have it delivered in a neat little capsule, I would probably use it. My cupboards are littered with forlorn jars of long-dead (and in some cases, now illegal) spices. The price would be higher on a per-gram basis than the individual spices, but would still be attractive. You should patent this or something. I did initially think this would be something to do with Dune. Preferably not the film ver. Yes. The dispensherb. It will be so. oh yes... it will be so. [xandram] I was going to mention teh availablilty of bulk spices as well, but if you buy just a pinch, they'll eight the whole bag and you'll pay 10 times the price. Not to mention that usually only very common spices are offered this way. Back in the day my mom always bought spices bulk, but this one spice we used often was only available in small-sized brand name containers. When I went to college I was equiped with a large handful of these identical bottled, refilled with various bulk spices. This idea could combine the spices to save a bag (or maybe have reusable bottles that you purchase the first time), and could be set up to measure the spices accurately. Also there would be less concern about contamination or freshness, and it could probably be set up to take much less space in the store. Hey, you know those packets of taco seasoning or other flavors you can buy to make one dinner? This could be direct competition for those, but be able to offer a much wider selection. You might want to include a corn starch dispenser in it as well for that purpose. Also bulk spice traders and other highly specialised vendors don't help you unless you live where they are. Nearest to me - probably 3000km. This machine could go into the local supermarket. 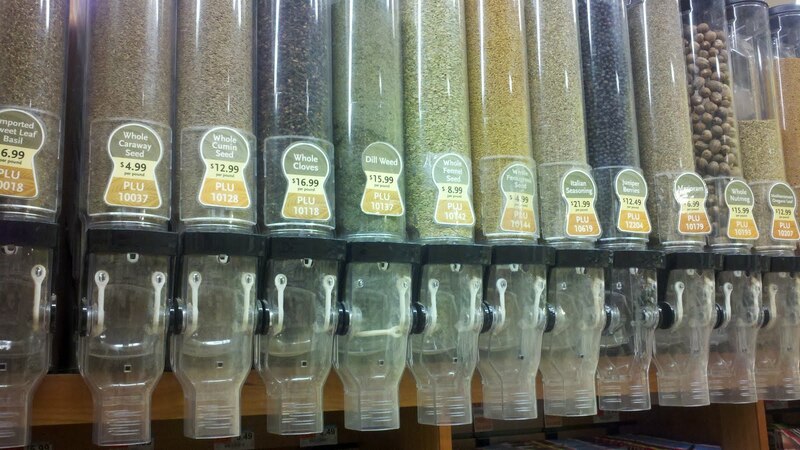 These bulk containers ARE in the supermarkets, so I'm still missing the point I guess. Seriously, the bag weight is really not much, less than a half gram I would think. They also subtract the weight of the container at some stores if you buy honey or something you need to put in a container. So you mean this is about *spice mixtures*? Buying in bulk is just a term that means it's not Pre-Packaged, not that you must buy a large quantity. [BigS] The exact point is that you may purchase as much or as *little* as you want /need. Some spices are already mixed like curry and chili powders, or you may buy the separate spices and blend them to your taste. I'd like some feedback from [dbmag9]!! I like this and can envision a situation where an infrequent cook wanting to try an ambitious recipe first to the vending machine with recipe in hand. They dial up 2 tsp cumin, 1/4 tbsp sesame seeds, and whatever is is stipulated into one or two ziplock bags then is issue a printout with the total cost and is on their way. No buying great quantities of saffron when all they want was a tiny bit for a one-time recipe. I think the point is that it's a machine that weighs and dispenses the spices. From the "suitable for individual recipes", I assumed it would be able to make up spice mixes. The second link shows little packs containing the weighed spices for a particular recipe. Given that this exists, I think there would be a market for a machine that could dispense mixes for any of hundreds of listed recipes. People will pay for novelty as well as the convenience of not having to weigh out twelve different spices. Supermarkets often give away recipe cards to promote various ingredients; the cards could carry a QR code which the spice dispenser would recognise, so you buy your pork drumsticks or chicken ribs and then get the ready-mixed spices to go with them. No, I don't do the shopping. But if I did, I might buy a couple of pounds of pork, wander over to the spice vending machine, look down the list until I see an interesting recipe, and then punch in the number to get a weighed and priced pouch with a mix of several spices for Szechuan spicey pork. It would be more convenient, both in the shopping (one number, one item) and in the cooking (one item). If I cooked regularly, I would keep a supply of spices and top them up as necessary. But I don't, and I would find it more convenient and more fun to do it this way. So, to answer your question, yes, I would. Additionally, a machine like this precludes the need for having specialised spice vendors on every corner. There literally is not a vendor like that within 30 hours drive of where I live, that I am aware of. A machine like this would allow for wider distribution of availability of specialty spices. [+] bun for everyone that modified the idea to make it more useful. I like the idea of getting the exact spice mix I need to make my date believe I know how to cook. But it seems pretty clear to me that "various quantities" and "for individual recipes" means a small mix of spices just for whatever it is you happen to want at that time. I can't see what is wrong with that....and I've never seen it before. [xandram] - don't leave in a huff. Stick around and leave in a minute and a huff.